Mate 9 is expected to be released in December this year. Various images of the device have been leaked on some websites. And the specs have been leaked in the market. Here are the specs. In the CPU, the device is said to have four Cortex A73 cores and four lower Cortex A53. The upcoming Mate 9 is expected to come in two variants. The first option comes with 3 GB RAM and 64 GB internal memory, and the other variant is equipped with 4 GB RAM and 128GB internal memory. The internal memory of the smartphone can be expanded up to 200 GB using microSD card. The device runs on Android OS Nougat v7.0 coupled with Emotion UI v5.0. It will be powered by 4250 mAh Li-Po non-removable battery. This battery offers fast charging technology in Mate9. 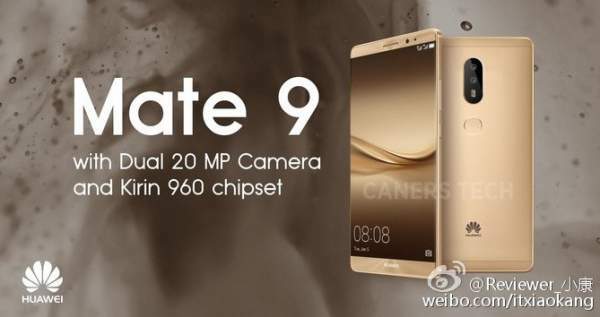 Huawei Mate 9 Features: The phone is having a sleek design with a golden colored metallic finish. Over the camera, the primary camera includes two 20 MP camera with camera optical stabilization. Like the iPhone 7, Huawei is also setting up the dual rear camera in this device. The primary camera of the device comes with Leica imaging technology. On the front, there is a 8 MP shooter for selfies and video calling. In this smartphone, the company is using one color sensor and a monochrome one for Mate 9. The device will have a fingerprint sensor on the back. Mate9 is expected to have a single stereo system instead of dual stereo system. Other connectivity options like Wi-Fi 802.11, Hotspot, Bluetooth v4.2, GPS, and NFC are also available in this Mate 9. It is said to support 4G network and is a Dual SIM handset. The device will have a lens which combines black and white image sensor. The device can be bought for a great build, large battery backup, huge capacity and robust configuration. Huawei Mate 9 Price: The 3 GB and 64 GB variant cost about $480 and the other variant with 4 GB and 128 GB cost about $590. The official information of this device is likely to be launched in the month of December. Wait for the launch of the device and expect a better device till then. Hope you liked the content. Stay tuned for more latest phone news and updates. why fhd still? we need at least 2k now.